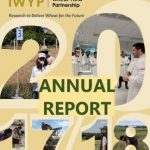 The International Wheat Yield Partnership (IWYP), a partnership of public sector agencies and private industry focusing on innovations in wheat breeding for significant yield increases, recently released its 2017-2018 Annual Report. 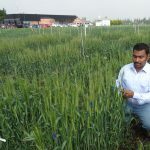 Many new research discoveries have been recorded over the last year, from germplasm with traits to improve genetic yield potential to molecular genetic markers associated with a target trait and new methods and technology to improve screening of individual wheat lines. Accomplishments include making wheat lines with higher biomass and grain yields available for release in national programs, validating the hypothesis that combining parents with high biomass and good harvest index can boost genetic gains. 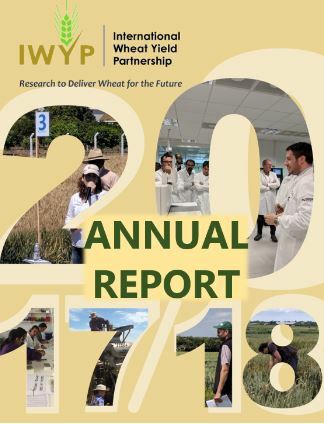 IWYP researchers have also made publicly available new wheat lines with increased grain size and spike morphology, which several breeding companies in the UK, Europe and Brazil have requested. Yield trials have also led to the discovery of several physiological trait lines that outperform the best local and International Maize and Wheat Improvement Center (CIMMYT) check varieties in over 27 environments. The Partnership, which includes 30 projects in more than 50 laboratories in 12 countries, is now in its third year. 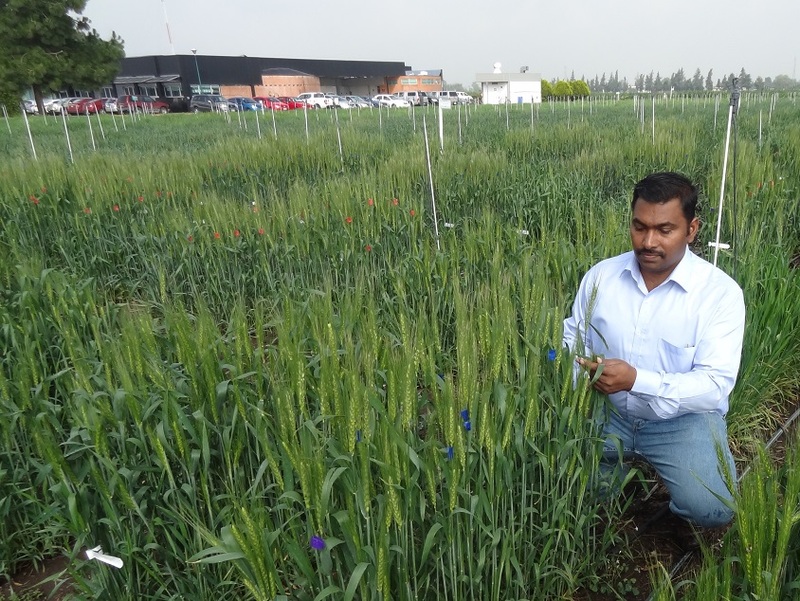 Outputs from its earliest projects are currently being validated and integrated in a prebreeding pipeline at the IWYP Hub at CIMMYT for development into pre-products. This ensures the best “toolbox” of new traits, genetics, and technology to reach its critical challenge of raising genetic wheat yield potential 50 percent by 2035. A spatial mapping and ex ante study regarding the risk and potential spread in South Asia of wheat blast, a mysterious and deadly disease from the Americas that unexpectedly infected wheat in southwestern Bangladesh in 2016, identified 7 million hectares of wheat cropping areas in Bangladesh, India, and Pakistan whose agro-climatic conditions resemble those of the Bangladesh outbreak zone. The study shows that, under a conservative scenario of 5-10% wheat blast production damage in a single season in those areas, wheat grain losses would amount to from 0.89 to 1.77 million tons, worth between $180 and $350 million. This would strain the region’s already fragile food security and force up wheat imports and prices, according to Khondoker Abdul Mottaleb, first author of the study. “Climate change and related changes in weather patterns, together with continuing globalization, expose wheat crops to increased risks from pathogens that are sometimes transported over long distances,” said Mottaleb. Foresight research at the International Maize and Wheat Improvement Center (CIMMYT) has focused on new diseases and pests that have emerged or spread in recent decades, threatening global food safety and security. 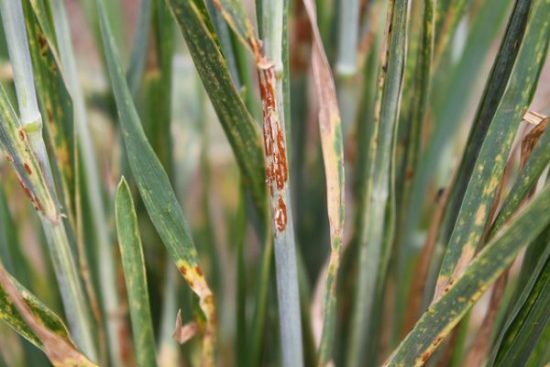 For wheat these include Ug99 and other new strains of stem rust, the movement of stripe rust into new areas, and the sudden appearance in Bangladesh of wheat blast, which had previously been limited to South America. CIMMYT has played a pivotal role in global efforts to study and control blast, with funding from the Australian Center for International Agricultural Research (ACIAR), the CGIAR Research Program on Wheat (WHEAT), the Indian Council of Agriculture Research (ICAR), and the United States Agency for International Development (USAID). 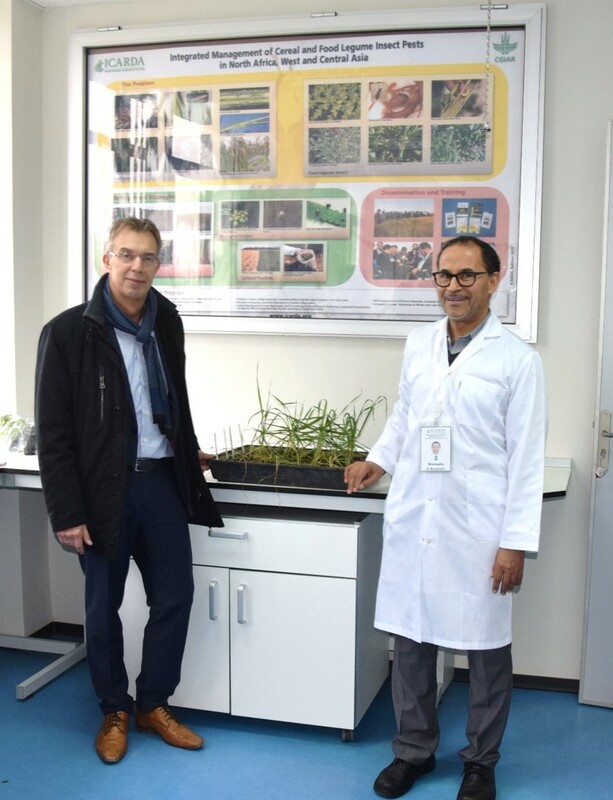 This has included the release by Bangladesh of the first blast resistant, biofortified wheat variety in 2017, using a CIMMYT wheat line, and numerous training events on blast for South Asia researchers. Based on a recent, special compilation of 12 reports published in the scientific journal Cereal Foods World during 2014-2017, eating whole grains is actually beneficial for brain health and associated with reduced risk of diverse types of cancer, coronary disease, diabetes, hypertension, obesity and overall mortality.EL BATAN, Mexico (CIMMYT) – A new, exhaustive review of recent scientific studies on cereal grains and health has shown that gluten- or wheat-free diets are not inherently healthier for the general populace and may actually put individuals at risk of dietary deficiencies. 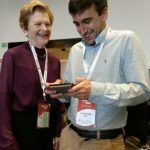 “Clear and solid data show that eating whole-grain wheat products as part of a balanced diet improves health and can help maintain a healthy body weight, apart from the 1 percent of people who suffer from celiac disease and another 2 to 3 percent who are sensitive to wheat,” said Carlos Guzmán, wheat nutrition and quality specialist at the Mexico-based International Maize and Wheat Improvement Center (CIMMYT), which produced the compilation. Guzmán said wheat and other grains are inexpensive sources of energy that also provide protein, digestible fiber, minerals, vitamins, and other beneficial phytochemicals. 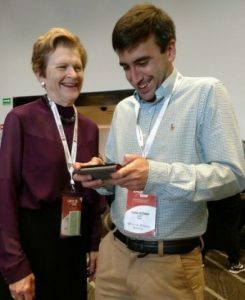 Guzmán and hundreds of other grain quality and health specialists will meet for the 4th Latin American Cereals Conference and the 13th International Gluten Workshop, organized jointly by CIMMYT and the International Association for Cereal Science and Technology (ICC) in Mexico City from 11 to 17 March 2018. Contributing to humankind’s development for the last 10,000 years, wheat is cultivated on some 220 million hectares (539 million acres) worldwide. The crop accounts for a fifth of the world’s food and is the main source of protein in many developing and developed countries, and second only to rice as a source of calories globally. In the many countries where milling flours are fortified, wheat-based foods provide necessary levels of essential micronutrients such as iron, zinc, folic acid and vitamin A. Inhabitants in developing and industrialized countries are experiencing higher incidences of diabetes, allergies, inflammatory bowel disorder, and obesity. A profitable industry has developed around gluten- and wheat-free food products, which the popular press has promoted as beneficial for addressing such disorders. But much scientific evidence contradicts popular writings about these food products. “Much of the anti-grain messaging comes from publications produced by supposed ‘specialists’ who are not nutritionists, and are often built on faulty premises.” according to Julie Miller Jones, Distinguished Scholar and Professor Emerita at St. Catherine University, U.S.A., and a key contributor to the review studies in the compilation. 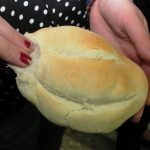 CIMMYT scientists are concerned that the negative portrayal of wheat to promote the lucrative gluten-free fad diet industry will discourage low-income families from consuming the grain as part of an affordable and healthy diet, particularly in areas where there are few low-cost alternatives. Consumer Reports magazine reported in January 2015 that sales of “gluten-free” products soared 63 percent between 2012 and 2015, with almost 4,600 products introduced in 2014 alone. Retail sales of gluten-free foods in the United States were estimated at $12.2 billion in 2014 and by 2020 the market is projected to be valued at $23.9 billion, Statistica reports. However, wheat biofortified through breeding or fortified during milling with zinc and iron can play a vital role in diets in areas where “hidden hunger” is a concern and where nutritional options are unaffordable or unavailable. About 2 billion people worldwide suffer from hidden hunger, which is characterized by iron-deficiency anemia, vitamin A and zinc deficiency. The compilation draws on more than 1,500 peer-reviewed studies regarding the dietary and health effects of eating cereals and wheat-based foods. CIMMYT specialists also worry that misinformation about wheat might affect investments in vital research to sustain wheat production increases of at least 60 percent by 2050, the output required to keep pace with rising population and demand, according to Hans Braun, director of the center’s global wheat program. The compilation was produced with special permission from AACC International. 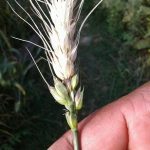 A commentary published on 30 January in the leading science journal Nature Plants highlights the importance of an ancient grass species for wheat breeding. 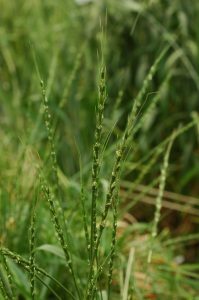 The commentary was sparked by the recent publication of a reference genome from Aegilops tauschii, also called goat grass. 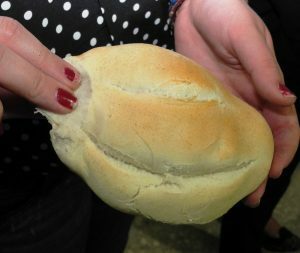 Bread wheat was created some 10,000 years ago by a natural cross of more simple, primitive wheats with a sub-species of goat grass. As such, goat grass genes constitute a major component of the very large wheat genome. The sequencing of goat grass DNA opens the way for wheat breeders to apply a number of advanced approaches to improve the speed and precision of wheat breeding for important traits that may be found in the goat grass segment of the wheat genome. 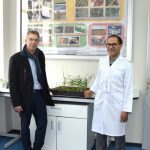 The International Maize and Wheat Improvement Center (CIMMYT) and the International Centre for Agricultural Research in the Dry Areas (ICARDA) have produced many wheat x grass crosses, recreating the original, natural cross but using other goat grass species and thus greatly expanding wheat’s diversity. Wheat lines derived from those crosses have since been used in breeding programs worldwide and have helped farmers to boost yields by up to 20 percent. Goat grass is known for being highly adaptable and disease tolerant, so the crosses endow wheat with similar qualities. Varieties from these crosses make up over 30 percent of international seed stores. 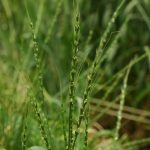 Researchers expect that the sequencing of this grass species’ DNA will facilitate advanced approaches such as “speed breeding” – a technique that uses controlled variables to achieve up to seven rounds of wheat crops in one year. This will help allow wheat breeding to keep up with the rising global demand for the crop and to address the challenges of new, virulent diseases and more extreme weather. Read the Nature Plants article: The goat grass genome’s role in wheat improvement. 2018. Rasheed, A., Ogbonnaya, F.C., Lagudah, E., Appels, R., He, Z. In: Nature Plants. 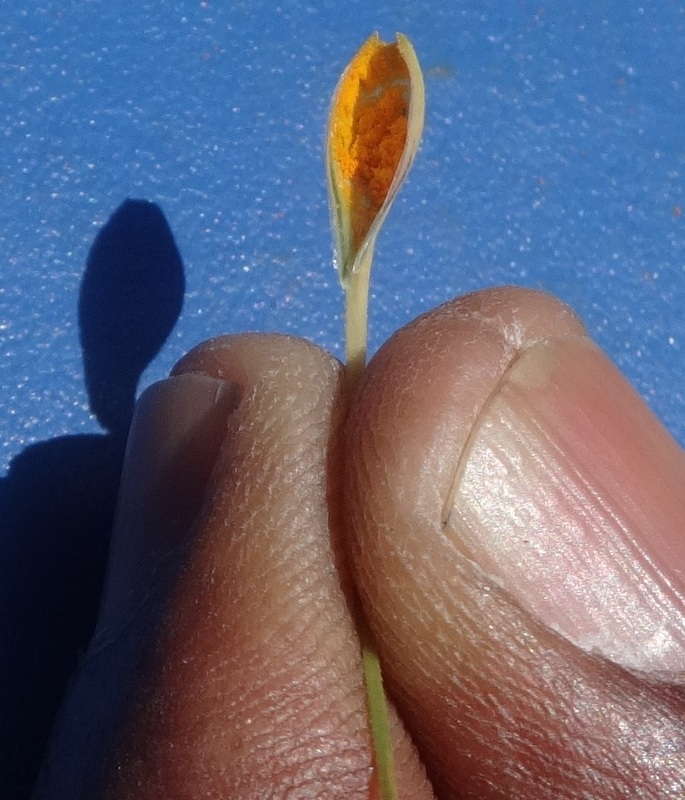 A significant breakthrough in combatting wheat stem rust disease caused by the fungus Puccinia graminis f. sp. 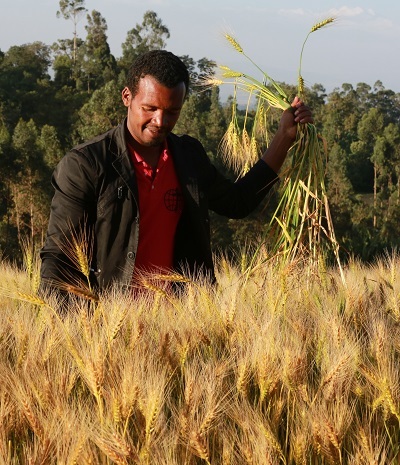 tritici was recently achieved through the combined work of an international collaborative team, showing the power of cooperative research approaches. 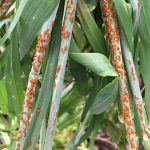 The emergence of the Ug99 race of stem rust in Africa and the Middle East together with the appearance of new strains in Europe catalyzed a major effort to identify new sources of stem rust resistance and breed these genes into wheat lines. 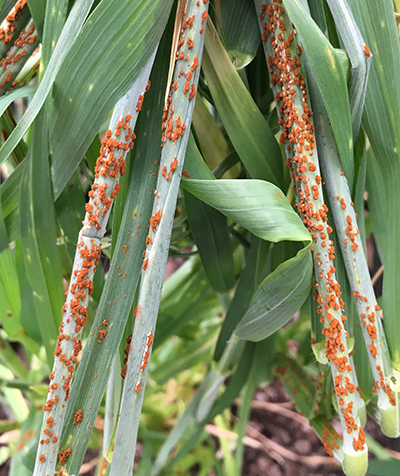 However, the continued emergence of stem rust variants that overcome new resistance genes, now demands an increased focus on pathogen evolution and virulence mechanisms. 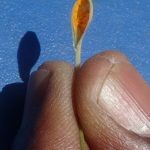 Numerous stem rust resistance (Sr) genes are known and in recent years several of these have been cloned and used to develop so-called ‘perfect’ markers to allow more rapid and accurate breeding. These genes typically encode immune receptors that recognize specific protein components of the fungal pathogen to trigger resistance. 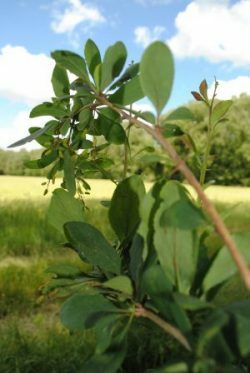 However, the molecules recognized by these Sr genes have been unknown until now, hampering our understanding of how new strains of P. graminis f. sp. 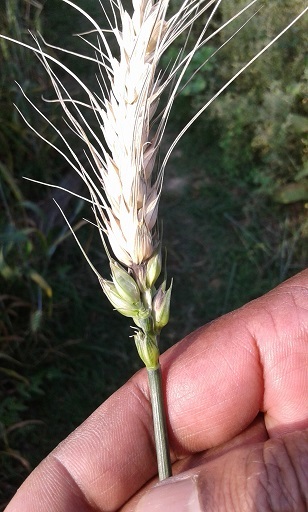 tritici evolve to escape plant recognition. New insight into this evolution came from the identification of the protein, AvrSr50, which is recognized by the wheat Sr50 resistance gene, by an international collaboration led by Dr. Peter Dodds (CSIRO Food and Agriculture and University of Minnesota Adjunct Professor) and Professor Robert Park (University of Sydney and Director of theAustralian Cereal Rust Control Program) and involving teams in the UK and the US.